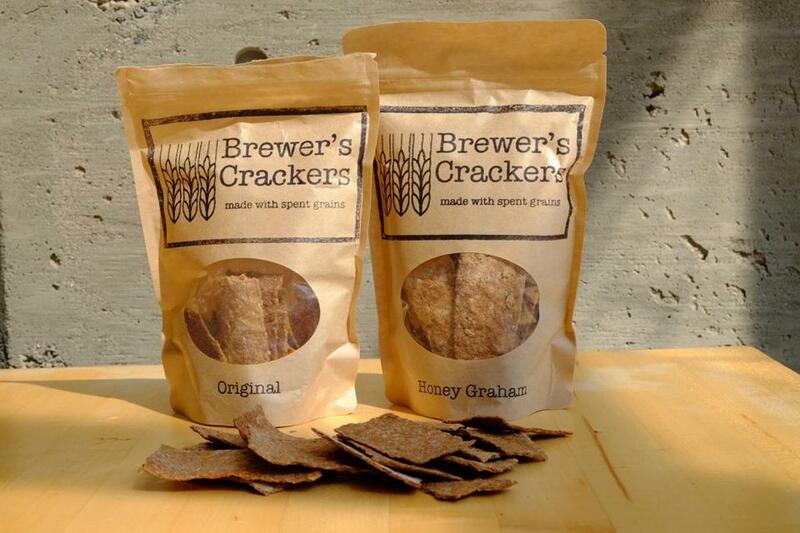 Makers of Brewer’s Crackers use spent grains from Lamplighter Brewing Co.
NORTH HAMPTON, N.H. — Enter Throwback Brewery’s large white barn, which houses both its restaurant and beer-making facility, and you’re quickly enveloped in the boisterous atmosphere and sweet, malty-yeasty aromas. Fifteen beers are on tap, with a variety also represented on the food menu. Chef Carrie Dahlgren not only cooks with beer, but often incorporates the brewery’s primary byproduct: spent grain. Dahlgren adds the chewy nubs (mostly barley) to the dough for sandwich bread, burger buns, and German-style pretzel knots. “It’s a way to tie into the brewery other than just using the beer,” she says. The chef also dries spent grain and grinds it into coarse flour which she uses in the pub’s chocolate chip cookies. “It gives a richer, toastier flavor that pairs well with the dark chocolate,” she says. In the beer-making process, very simply, crushed malted barley and sometimes other grains, such as wheat and rye, are soaked in hot water (a process called mashing), which converts the grains’ starches into fermentable sugars. The liquid, called wort, is drained off and continues through a number of steps, including the addition of hops and yeast, to ferment and become beer. The grain becomes a waste product typically used for animal feed. Chuck Skypeck, technical brewing projects manager of the Brewers Association in Boulder, Colo., says, “Feeding spent grain to livestock is as old as beer itself.” It is estimated that 90 percent of spent brewers’ grain, which contains protein, fiber, and some minerals, is disposed of as animal feed, 7 percent for composting, and the remaining 3 percent as garbage, human food, or for energy production. Some creative fungi farmers grow mushrooms in it; Alaskan Brewing Co. is turning it into fuel. Located in Cambridge, Lamplighter Brewing Co. sends its used grain to a compost facility near Boston. Cofounder Cayla Marvil says farms that could use the grain for animal feed are too far for her to ship it to. Over the past year though, in a small effort at food recycling, the brewery regularly gives 5-gallon buckets of spent grain to Kyle Fiasconaro, who bakes his crisp Brewer’s Crackers at Cutty’s sandwich shop in Brookline. The brewery sells the crackers and also serves them with its cheese plates. Up in Bristol, Vt., Red Barn Lavash has been making cracker-like flatbread with spent grain for two years. Chef and founder Greg Lang gets the barley and some wheat from Long Trail Brewing Co. of Bridgewater Corners. Lang, executive chef of Killington Grand Resort, says he’s frequently cooked with beer, so it wasn’t much of a leap to utilize the spent grain in baked flatbread. At Tree House Brewing Co. in Charlton, co-owner Dean Rohan says, “Everyone’s tried baking bread, cookies, brownies, and granola bars with [spent grain]. In the end, it’s about 18,000 pounds a day, four times a week.” Their eager beneficiaries include local pigs, goats, and cows. Two UCLA graduates have been unfazed by just that kind of garbage. San Francisco-based ReGrained founders Daniel Kurzrock and Jordan Schwartz make granola-like bars — Honey Cinnamon IPA and Chocolate Coffee Stout — using brewers’ spent grain, almonds, oats, and puffed quinoa and brown rice, among other ingredients. The grain, says Kurzrock, is “spent to the brewer, but it’s not waste.” As sustainability is one of the company’s primary goals, even the bars’ wrappers are compostable. With an estimated 1.1 million homebrewers in the United States, the utilization of even a small portion of home-generated spent grain will help keep it out of landfills. (A 5-gallon brew size, for example, might generate 10 to 15 pounds of spent grain.) Brooklyn Brew Shop (www.brooklynbrewshop.com), which sells beer-making kits, offers more than 50 recipes on its website (look for “Spent Grain Chef” under the Articles menu). Company cofounder Erica Shea, who grew up in Georgetown, says she “started experimenting to turn the grains into a more usable ingredient.” She’s developed recipes for spent grain granola, burger buns, cookies, crackers, muffins, falafel, and veggie burgers. On post-brew days, Shea recommends making spent grain pizza dough. “You can throw the grains in wet, which adds texture, chew, and a slightly nutty flavor.” Wet grain spoils quickly though, so it must be refrigerated, frozen, or dried and ground into coarse flour. Some brewers’ grains have gone to the dogs. Literally. The folks at Newburyport Brewing Co., whose taproom welcomes dogs accompanied by their humans, provide spent grain from their Plum Island Belgian White ale to Quinn’s Canine Cafe, also in Newburyport. Owner Quinn Soine-Norris uses the grain, along with eggs, molasses, and dark rye flour, to make Molasses Ale dog biscuits. “The dogs just love the grains,” she says. The brewery offers the canine treats free-of-charge to patrons, but happily takes donations for nearby Sweet Paws Rescue.